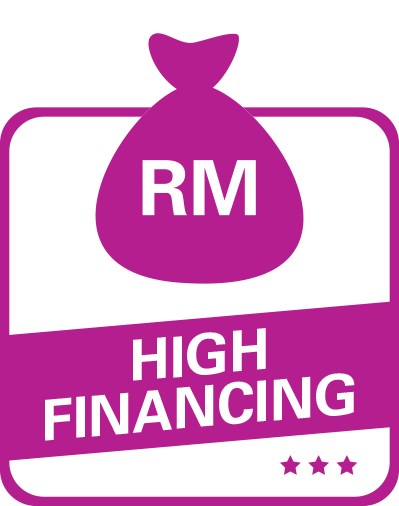 Personal Financing With up to RM100,000 financing available, you can provide your family with what they deserve. Apply now. TOGETHER we realize your potential. School fees? Starting a business? Medical costs? With up to RM100,000 financing available, you can provide for the people that matter most. 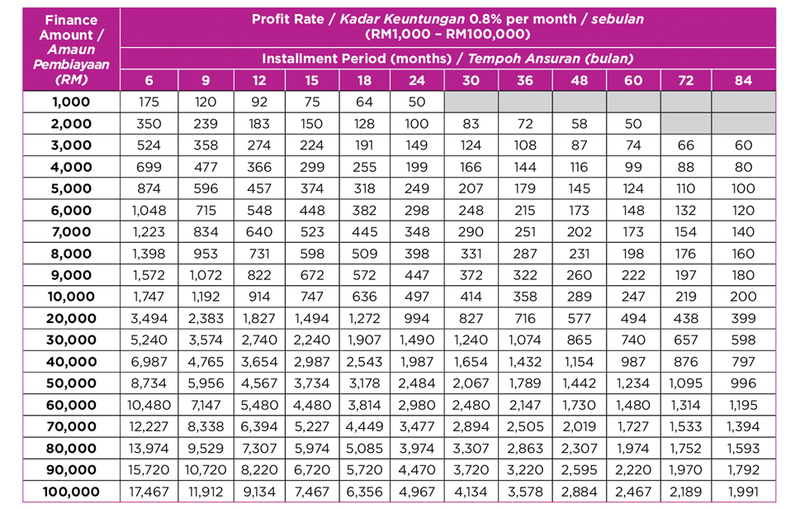 Monthly repayments as low as RM55. 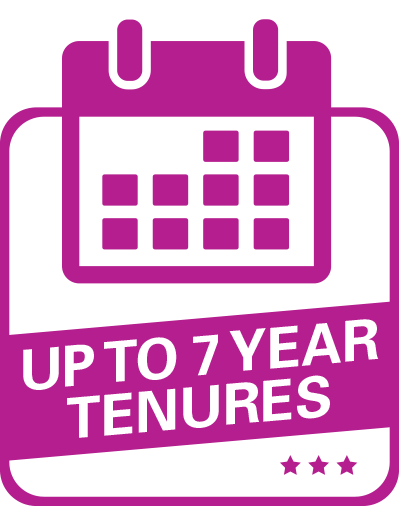 Enjoy repayment tenure up to 7 years. You can even get your cash on a Sunday. Very easy to apply. You just need to have relevant documents ready. No guarantor, no collateral & no security deposit. A Syariah principle involving the sale and buy-back transaction of assets by a seller. A seller sells an asset to a buyer on a cash basis and later buys it back on a deferred payment basis where the price is higher than the cash price. 18 years of age and above. 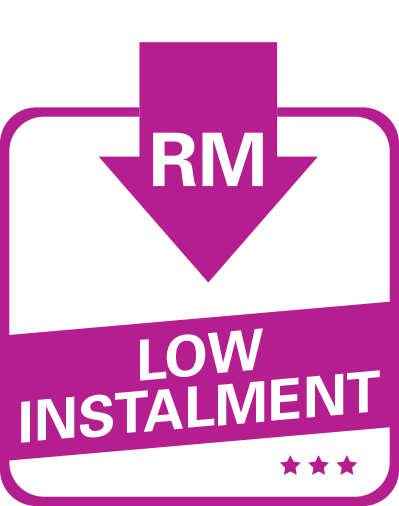 *4% processing fee for financing amount between RM1,000 to RM10,000 and 2% processing fee for financing amount between RM10,100 to RM100,000 (Maximum processing fee is capped at RM400). *All applicable taxes shall be payable by the customer (if any). For further detail please log on to www.aeoncredit.com.my. 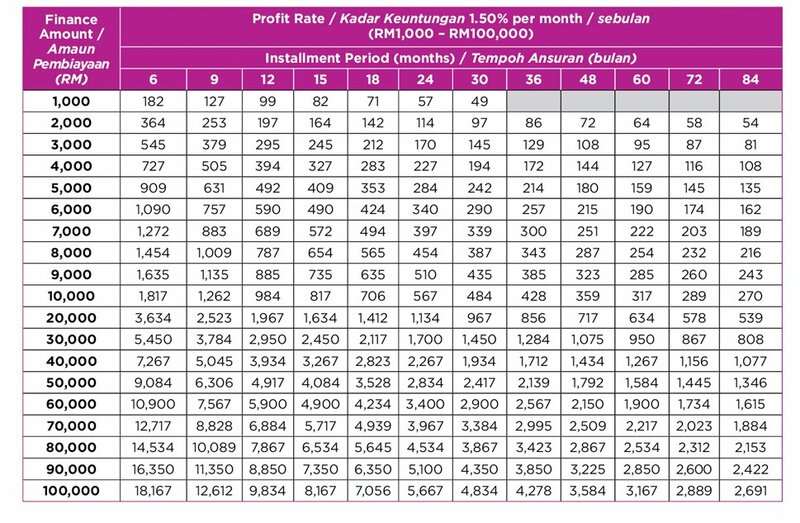 *Effective 1st October 2018, AEON Credit Service (M) Berhad will revise the Personal Financing Profit Rate for financing amount of RM1,000 to RM100,000 from 0.66% - 1.50% per month. *Actual financed amount may vary from the above tables. Q. What is AEON i-Cash Personal Financing? 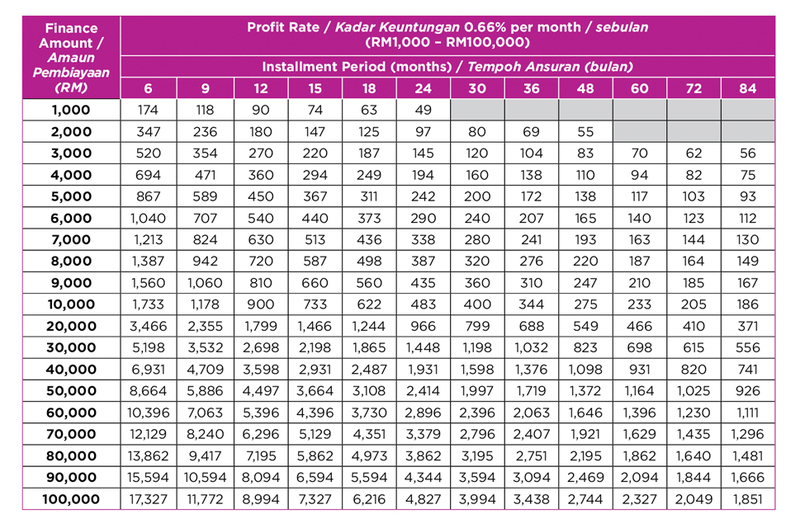 A. AEON i-Cash Personal Financing is an unsecured Islamic Financing that does not require any collateral. Q. What is the applicable Shariah concept? / Apakah konsep Syariah yang digunakan? A. The applicable Shariah concept is Bai Al Inah concept (sell-buy back with installment payment) / Konsep Shariah adalah berasaskan konsep Bai Al Inah (jual-beli semula dengan bayaran ansuran). Q. What is the minimum and maximum facility amount that customer can apply? A. 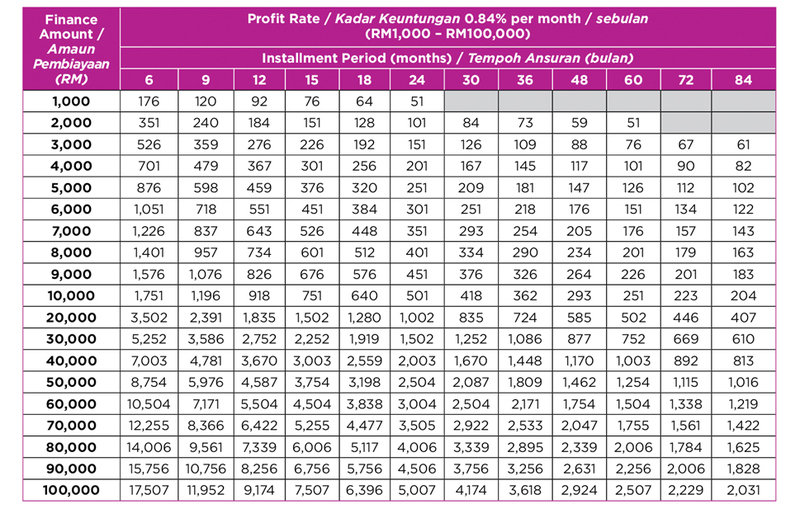 Minimum facility amount is RM 1,000.00 and the maximum facility amount is RM 100,000.00. Facility amount approved is subject to AEON Credit’s assessment. Q. What documents are required to apply for AEON i-Cash? Q. Is there any security deposit required for the facility amount approved? A. There is no security deposit required. Q. How long is the approval process? A. The approval for the facility is within 1 to 3 days. However, it is subject to full documentation and information received by AEON Credit Service. Terms and Conditions apply. Q. 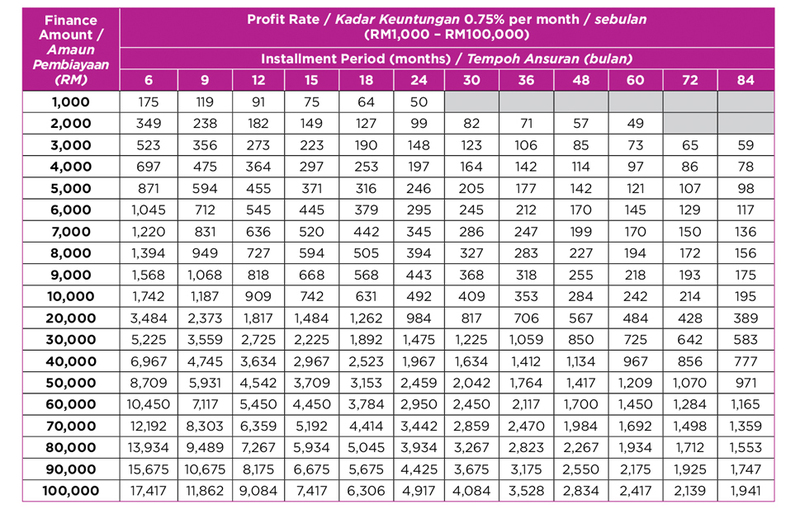 How do I pay for my AEON i-Cash Personal Financing? Check out our How to Pay section for more details. Q. How do I obtain the funds once the facility has been approved? A. Customers are required to sign the Sales & Purchase Agreement at the respective AEON Credit’s counter and funds will be transferred to either Savings or Current account of the Bank selected by the customer. 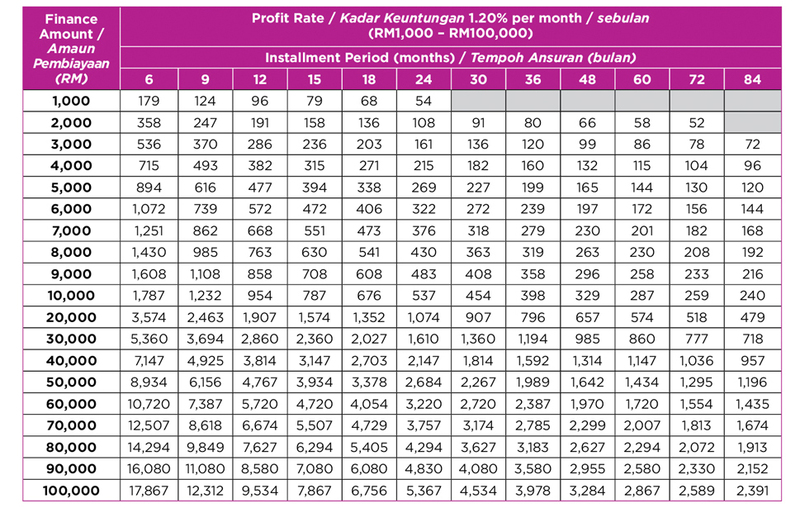 Alternatively customer can opt for the funds to be disbursed via the AEON Credit Prepaid MasterCard for up to RM10, 000 and withdraw at any nearest AEON Credit’s Branches using the Automated Teller Machine (ATM) facility. Q. When is the payment due? A. The payment is due on every 2nd of the month. Q. What are the late payment charges? Q. What if I need personal assistance? Q. How to I check my outstanding balance? A. You can either call our customer service hotline, log in with your username and password or checking out the SMS Enquiries page for more information. Q. What are the major risks if I default in my payment? A. Compensation (late payment) will be imposed and the outstanding payment amount will accrue in the event you default in your repayment. If you are facing difficulties in meeting your loan obligations, please contact us in advance to discuss repayment alternatives. Let us calculate your Monthly Instalment (subject to final approval).